This post was written by Tara Berger of One Stylish Party for Shutterfly. It’s beginning to look a lot like the holidays, and with the holiday season comes many time-honored traditions. One of my favorite holiday traditions is decorating gingerbread houses with my children each year. It is the perfect Christmas party idea to get the kids involved, allow them to be creative and make a mess while creating memories together. This year, I decided to host a Gingerbread House Decorating Party for a few of our family friends. It was the perfect occasion to pause in the middle of a busy holiday season to catch up with friends while our kids played with one another, made gingerbread man cookies and decorated their own gingerbread house to take home. I decided to take a fresh and minimalist approach to the color palette for the party by utilizing winter white, light tan with accents of fresh greenery for the decor, inspired by our Christmas card design this year. I carried the color palette throughout the party details, including the Christmas tree ornaments (with my favorite personalized ornament from Shutterfly), wrapped gifts under the tree, the candy buffet and the place settings for each child at the gingerbread house decorating table. A key element to a successful gingerbread house decorating party is to pre-make the gingerbread houses ahead of time to ensure the royal icing has time to set. Remember to make sure to know how many houses you will need for the project. I suggest to buy gingerbread house kits in bulk to save a few dollars. You can put that money towards candy or pattern design templates I also recommend attaching the gingerbread houses to a small cake board to make it easy to move and transport. I took it a step further, and added a few embellishments to each house, such as some snow on the roof, a piped door and a cookie name plate with each child’s name on it. The dining room served as the gingerbread house decorating station. Each place setting at the table included a personalized apron, gingerbread house and royal icing pastry bag. To make clean-up a breeze, I used kraft paper placemats under each gingerbread house, which helped catch some of the stray icing and candies. Behind the dining table, I styled an all-white candy buffet for the children to select the embellishments for their gingerbread houses. To give the candy buffet a polished look, I displayed the candies in inexpensive apothecary jars at varying heights and I also added a fresh floral arrangement at the center of the table. For an extra special touch, I hung a hand lettered kraft paper Christmas sign as the backdrop. Of course no holiday party is complete without some hot cocoa, so I set-up a small beverage cart with an insulated coffee pot to keep the cocoa warm, disposable kraft cocoa cups, marshmallows and cupcakes for guests to enjoy while decorating. 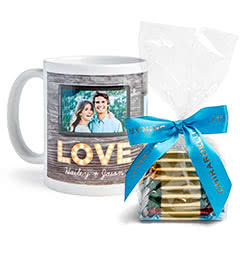 For the adults, I used personalized ceramic mugs from Shutterfly to serve both hot cocoa and coffee. It was nice to have the beverage cart close to the decorating station so the parents could easily handle refills without having to run back and forth to the kitchen. Once the guests arrived, the kids slipped into their aprons and got to work selecting the candies for their gingerbread house. While you could do an assortment of colors for the candies, I choose to keep the embellishments monochromatic to give the finished gingerbread houses (no matter how messy!) a more sophisticated look that both parents and kids would be proud to display throughout the holiday season. It was so fun to watch the attention to detail that each child had with the perfect placement of the candies on their gingerbread house. One of my favorite moments was when a big sister encouraged her little brother to try his hardest. All of the kids took pride in their masterpiece and couldn’t wait to show it off when they were done. Once the children finished decorating their gingerbread houses, we snapped a few photos and then moved over to the kitchen to make some gingerbread man cookies! I’ll be honest, this got even messier than the gingerbread house decorating, but my goodness, it was fun! The children took turns rolling the cookie dough and cutting out the gingerbread men. The parents would bake the cookies in between and then everyone worked together to decorate them. I wish I could capture the sound of laughter and the feeling of joy in the room that morning. There is nothing quite like experiencing the magic of the holiday season through the eyes of young children. I hope to continue the tradition of decorating gingerbread houses with with my children and close family friends for many years to come.